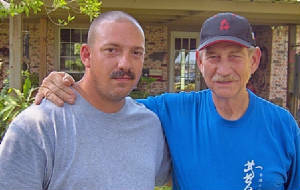 The Harlingen Bujinkan Shibu was started in 2005 as a satellite of the Chattanooga Bujinkan Dojo. We claim Harlingen, TX. as our home but as of this time we have no set location for training. We do all of our training out doors, be it at a members house or at one of the many parks in the area. The Shibu is guided by Scott Johnson, Nidan and Miguel Garcia, Nidan. Mr. Johnson started his training in Budotaijutsu in Oct. of 1993. 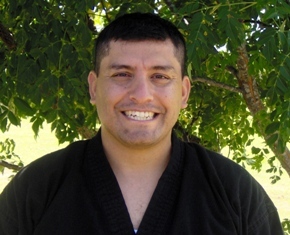 Mr. Garcia began training in Budotaijutsu in Oct. of 2005. Miguel has been training with the group since its inception. Miguel is a great asset to our group, his taijutsu and good nature make him a "natural" for this art. (Trust us he still puts in a lot of hard work on his training.) It is more than a pleasure to have him around. Miguel has been fortunate enough to do a little traveling and train with other members of the Bujinkan such as, Kendall sensei in Austin, TX. and Brian & Brian up in Virgina. His most recent travels took him and another member of our group to Alice, Texas where they had the opprotunity to train with Ed Martin among other notable practioners. Each time he brings a new way to look at things back to our group. "We are all teachers and students at various points of our daily life..."
All of our training is based on the Ten Chi Jin Ryaku No Maki. Bujinkan Budo Taijutsu is a collection of ancient martial arts under Dr. Masaaki Hatsumi Sensei, 34th Grandmaster. It consists of 6 Samuri Ryuha (schools) and 3 Ninjutsu Ryuha. These arts date back over a thousand years and were developed by Samuri and farmers to protect their families and country. These arts were tried and proven on the ancient battle fields of feudal Japan. Because of this we know that these arts work. It does not matter if you are short, tall, thin, or overweight, these arts work for all. There is no competition therefore there is no need to prove oneself to anyone. Each individual procedes at his or her own pace.